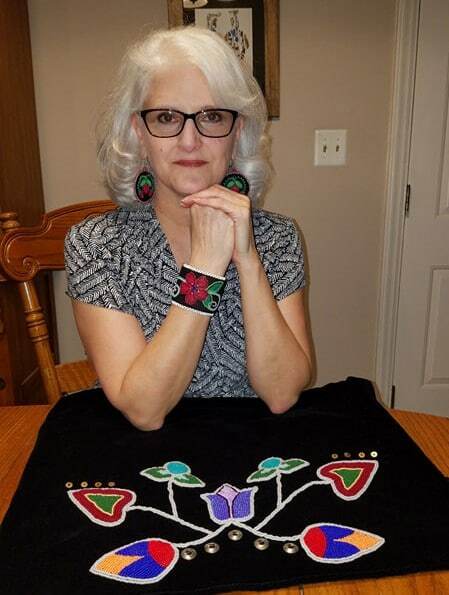 Peggy Kinder lives in Gladstone, Missouri, where she creates Potawatomi-inspired beadwork, ribbonwork, beaded fan handles, shirts, shawls, earrings, accessories and custom orders. “I don’t remember not doing any of it — it’s just been such a part of my life for so long,” she said. Until about 15 years ago, her art primarily documented and celebrated her Citizen Potawatomi Nation family and heritage, for events like ceremonies and powwows. When she was young, her mother and “Aunt Wilma” taught her beading, peyote stitch, loomwork, sewing and making traditional clothing. Loomwork isn’t her favorite beading method, so she leaves that to her brother Michael Hancock and her cousin, Laura Hewuse, who is more like a sister to her. She started with handmade ribbonwork, which she did for decades, she told the Hownikan during a recent telephone interview. In the last 15 years, she has used a sewing machine and Wonder-Under, a type of adhesive material that fuses fabric pieces together, to create ribbonwork. A highlight for her was beading a Prairie Band Potawatomi Nation elder’s ceremonial eagle fan. 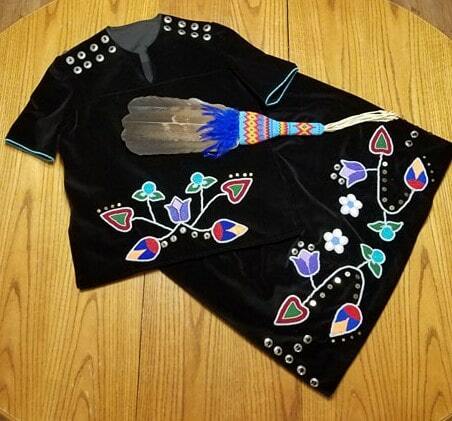 She is also asked to create burial clothes; leggings; aprons; vests; traditionally tied shawls; and peyote, brickwork and applique beadwork. “Those are the kinds of things that are quite an honor for me,” she said. Most of Kinder’s clients learn about her by word-of-mouth, Facebook groups and connections with other Potawatomi tribes. “I have a lot of people in the Great Lakes and Canada who order my work,” she said. 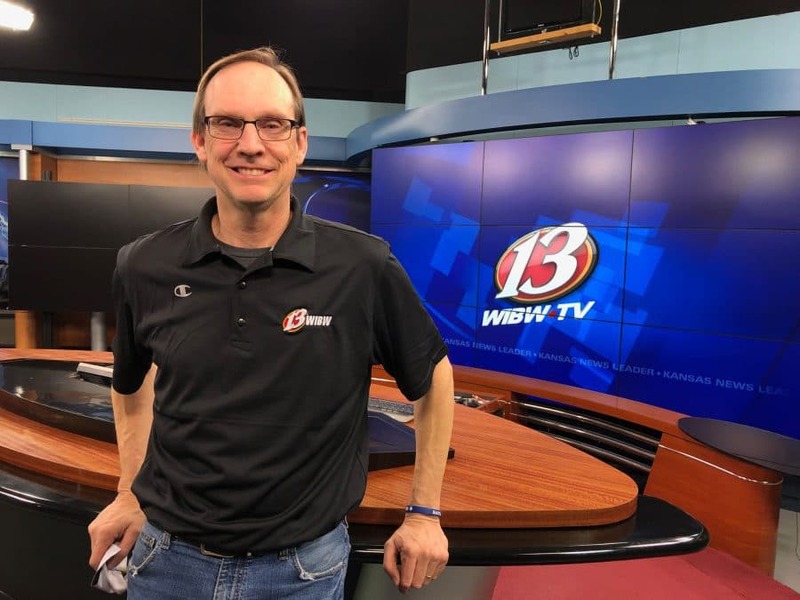 “And making connections and friends at the Gathering of Nations and Family Reunion Festival. Recently, Prairie Band Casino & Resort contacted me to purchase some of my earrings for their gift shop. So now they are carrying my work, and I am grateful. “I’m happy to make things for people that they are happy with and that they’re going to use properly in the arena or in ceremonies, but I get the most satisfaction out of making our traditional woodland patterns, our florals — because it is keeping ancestry alive,” she said. “And I get the most satisfaction out of the fact that I’m doing it by hand — I am old-school,” she said, then laughed. “Old-school. “I feel like every time I do something, I am making mom, my aunt and my grandma and all those ladies that came before, I’m making them happy. I hope I’m making them proud,” she added. “My grandma used to tell me that, my mom tells me that, my Aunt Wilma told me that. They pretty much still inspire me, and I do a lot of it for them — keep them alive. Peggy Kinder shared the family and cultural influences that inspired two complete, traditional Potawatomi outfits she created for Citizen Potawatomi Nation’s Cultural Heritage Center. They survived. The woman’s collection is on display, and the man’s collection is in secure storage at the museum, said CHC Curator Blake Norton. I made everything but the fan. The ribbonwork pattern I replicated from an old piece in the archives of the Milwaukee Museum. The original piece was so old that most of the silk used to make the strip was gone; all that was left was the decorative stitching around the design. I thought replicating an old design made at some point by one of our relatives would be good for this display. It is my way of honoring the initial maker; keeping that pattern alive. 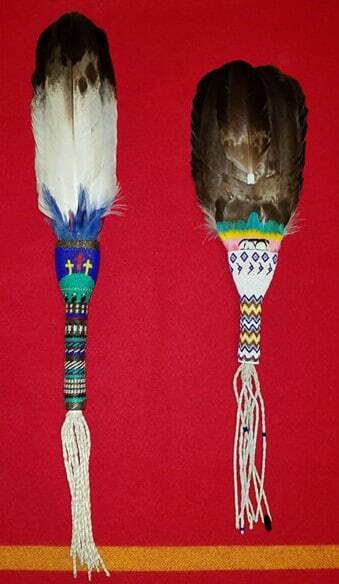 The Potawatomi sleeve bag was prominent with Potawatomi ladies when I was young. That’s why I wanted to include it in this display. We don’t see many of them anymore. The beads I purchased for the necklaces are as close as I could find to the multiple strands of beads our ladies wore. It took a lot of time stringing those up, and I was happy with how they turned out. The moccasins I made and put ribbonwork on the flaps. My cousin, Wilma Foth McAuley (great-granddaughter of Joseph N. Bourassa, and grew up calling her “Aunt Wilma”) and my mom were my first teachers. My mom, Elizabeth Hancock, used to enjoy loom beading. She taught me looming, and I did do several pieces, but it was never my favorite method of beading. Anyway, when Aunt Wilma found out I was making this dress for our Cultural Heritage Center, she was so excited. She had this silver brooch for a very long time. She wore it in the arena. 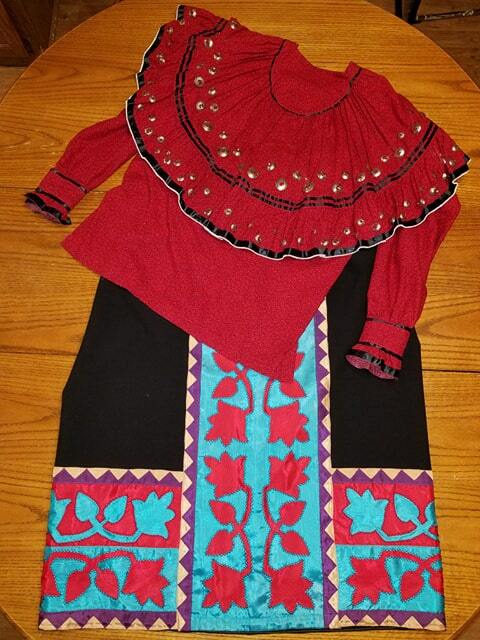 She gave me that broach to put on this sachkin (blouse) for the Cultural Center. I was touched and honored by her gesture. It is a treasure. The silver washer broaches on our clothing became identifiable with Nishnabe after contact with French traders. If you look at old photos of our men relatives, you will frequently see some kind of sash. Some are beaded, some fingerwoven, some ribbonwork. This pattern is an old one my Aunt Wilma gave me. I used it to honor her. I also used the same pattern on the apron. I love our woodland clothing and style.